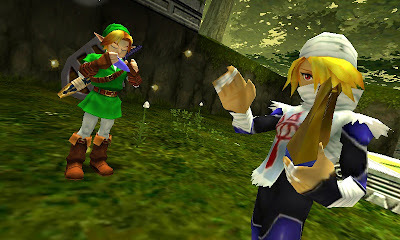 Ocarina of Time is the second 3D action game I've played, after Okami. I have yet to finish either, but I want to write a little about my Zelda experience before I forget it entirely. Action games tend to stress me out, but at the same time, my victories seem more connected to my button-pushing than any other game. It's enjoyable to play, but not all that relaxing (with our new puppy I need all the relaxing I can get). OoT strikes me very much as the classic action game that follows the traditional journey myth. There's even a dungeon that is the belly of a whale, for crying out loud. Dungeons are clearly part of the magical realm. There's a clear distinction between the overworld and the dungeon (indicated with texture changes, different music, etc.). Each dungeon has some sort of boon which makes Link closer to being a magical god-like hero. One part I'm wondering about is if OoT has some sort of false mother or temptress figure. I think I would classify Navi as a false mother, and maybe Zelda as the goddess we're always trying to meet with. Side-quests like fishing might be the type of temptress, sidetracking us from our main quests. Apotheosis is probably somewhere at the end of the game. Some things might be a bit of a stretch, but the dungeons in particular, with their clear thresholds, boons, and dragon-battles, seem well described by the journey myth.